Students from the Yucatan region of Southern Mexico have invented a portable water accumulator they call the “Chaac Ha”. 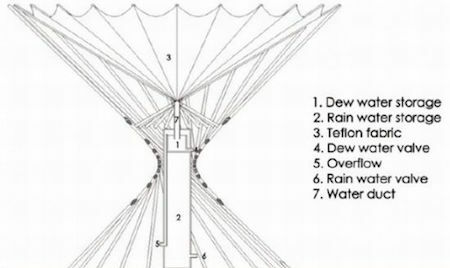 It is designed to gather dew for drinking water. Designed to provide regular, clean water to rural Mexican communities, the award-winning water collector is capable of gathering 2.5 liters of water from dew alone in one night. Drawing its name from the Mayan god of rain, the Chaac Ha takes its form a spider web. Presenting a collapsible design for easy portability, the water collector makes use of natural processes which helps in sustaining the environment. First, the form and material of the rainwater catching membrane is inspired by the way bromeliads funnel water toward a central pool. Bromeliads are epiphytes, which mean that they grow on other plants and derive their moisture and nutrients from the air and rain. See the Ask Nature database for more information: Leaves capture water: bromeliads. Bromelaid leaves are also hydrophobic, with microscopic irregularities that reduce adhesion and allow water to channel into a collection reservoir. The Chaac Ha uses Teflon to achieve a similar effect. Science fiction writer Frank Herbert wrote about this same idea in his remarkable 1965 novel Dune. Most of the novel takes place on the planet Dune, which has no liquid surface water at all. In order to plant vegetation, special materials are used to create dew collectors, to gather even the tiniest amount of moisture. "Each bush, each weed you see out there in the erg," she said, "how do you suppose it lives when we leave it? Each is planted most tenderly in its own little pit. The pits are filled with smooth ovals of chromoplastic. Light turns them white. You can see them glistening in the dawn if you look down from a high place. White reflects. But when Old Father Sun departs, the chromoplastic reverts to transparency in the dark. It cools with extreme rapidity. The surface condenses moisture out of the air. That moisture trickles down to keep our plants alive." In the dew collectors of Herbert's imagination, a special material changes from light to dark in order to pull moisture out of the air. 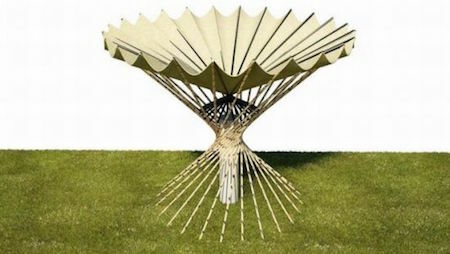 Via ecohunk and Sustainability Workshop; thanks to DuneSF for the tip on this story.